Local dynamo David Brewster introduces his latest project: a membership library to be called Folio: The Athenaeum. Folio will contain books and a precious commodity: quiet. David Brewster says he is an idea importer. Over the five decades he has lived in Seattle he has imported some extraordinary ones, civic institutions that have helped transform the city’s culture. He got many of his notions from somewhere else, but other than things like quantum physics, how many ideas are really new? The Seattle Weekly — Brewster, founding editor of the Weekly, says he got the idea for this alternative paper from Portland’s Willamette Week. Town Hall Seattle — Brewster modeled it on Manhattan’s fabled 92nd Street Y, a center for author readings and literature events in the heart of the nation’s publishing industry. This one is more than a gleam in Brewster’s eye. Folio (folioseattle.org), a 501-c-3 organization, has signed a lease with the Downtown Y, a handsome, 1930s-era brick and terra-cotta building at Fourth and Marion. Folio has leased 5,000 square feet of space at the Y, with 4,000 more square feet on the ground floor for expansion. He and Folio’s supporters aim for an October opening. Recently he took me on a tour and outlined his vision for the place. The architects working on Folio, Clint Pehrson and Rick Sundberg, have both worked on libraries. They are helping reconfigure the space to serve several purposes. Some areas will host audiences for author readings or other cultural events. There will be rooms for quiet work, with comfortable chairs and desks. There will be a small discussion room. There will reading rooms. There will even be spaces writers can rent as offices, though you will have to convince the powers that be that you are a bona fide author. And there will be a 50,000- to 100,000-volume library, already being assembled from book donations that have come flooding in. 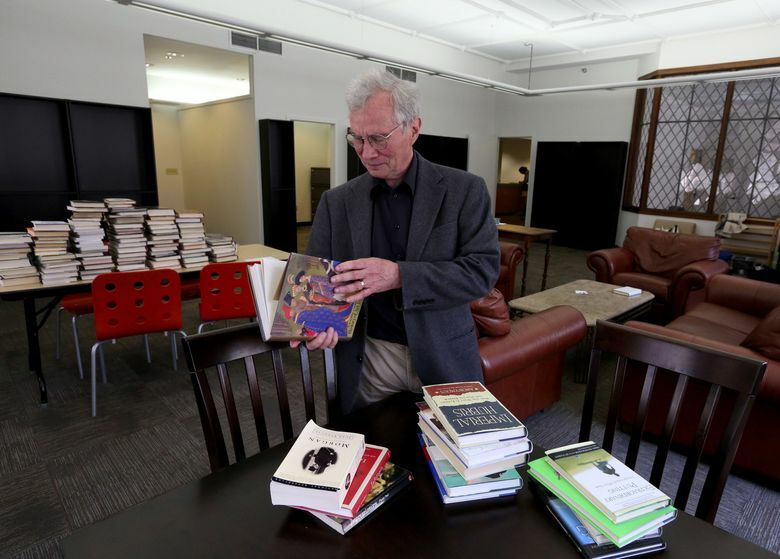 Mark Wessel, owner of the late, lamented Wessel and Lieberman used- and rare-book store, has donated 1,500 books and is applying his knowledge to helping Folio decide which to keep, and which to give away. The current cost for joining this outfit is the price of two or three lattes a month — $125 a year for an individual (less if you are a student or under 30, more for escalating levels of membership privileges). My worry for Folio is not that it won’t get enough attention, but that it will be deluged — we’re talking a pretty reasonable price for a beautiful book-filled work space in the heart of downtown, where 65,000 people live and 214,000 people work. A few steps north of the downtown Y on Fourth Avenue is the Seattle Public Library, a place historically devoted to book lovers. This was once the prime mission of libraries. But that mission has changed, Brewster says. Public libraries are increasingly being viewed by their funding governments as community centers. Steve Scher, former KUOW commentator and a member of the Folio campaign board, keeps up his love of books with his podcasts on books with Nancy Pearl. Scher is a fan, both for the idea of Folio as a center for writers and readers and as a repository for book collections that otherwise might be sold off. Library spokeswoman Andra Addison says that it’s true that Seattle Public Library runs a plethora of different programs — 400 a month! The downtown library does provide a quiet place to read — a reading room on the 10th floor, with no computers and comfortable seating. It’s possible to reserve meeting or study rooms too at many branches. But branches do buzz. Though there’s been an extensive renovation program for the satellite libraries, the sheer volume of programs means competition for space and resources.“This is not your grandma’s library, where everybody was shushed,” Addison said. Folio will be open to the public to some degree — you can read anything in its collection on site, or you can take away a free book from the donations that don’t make their way into the Folio library. Many events will be open to the public. But the concentration on and reverence for reading print books will prevail. Folio: The Seattle Athenaeum is nothing new; membership libraries have been around in America since Benjamin Franklin, who proposed one for Philadelphia in 1731. But, despite membership libraries in Boston, San Francisco, New York, London, San Diego, Providence, Newport, Cincinnati and Philadelphia, a new one hasn’t opened since 1899. He foresees Folio as one element in an “Arts and Letters” district in the city that includes Seattle Public Library, Town Hall Seattle, ACT Theatre, Seattle Art Museum and private clubs in the area (including the Rainier Club and the Women’s University Club, both of which hold author readings). Brewster has an exceptional track record of making things work. There are certainly things working against Folio — downtown traffic congestion, for one. But in the City of Amazon, many people still love the physical book. I’m betting there are a lot of us out there who would pay for a quiet place to read.